Xilinx has discounted a few development kits including the Spartan-6 FPGA Embedded Kit available for $695. It features the MicroBlaze core and Eclipse IDE for software development. The included SP605 Evaluation board is a high-end platform with 10/100/1000 Ethernet, SFP transceiver connector, GTP port, PCI express x1 edge connector, DVI/VGA out, 128MB DDR3 and multiple I/O connectors. The TI C5535 eZdsp dev kit is now available for just $55 through Oct. 24 Dec. 31, 2011 (extended). Normally priced at $99, the kit demonstrates the low cost TMS320C553x ultra-low-power fixed-point DSP family which start at about $2 in production volumes. 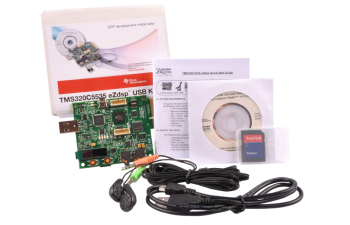 The kit features the TMS320C5535 DSP, an on-board emulator for debugging, USB 2.0 with free software framework for HID and audio class, Code Composer Studio IDE and eXpressDSP development software, the DSP/BIOS kernel, audio I/O connectors, headphone with mic, micro SD slot, a small 96x16 OLED display, pushbuttons and a 60 pin expansion connector. The development board is supported by Spectrum Digital Incorporated. You can find all the documentation at the eZdsp5535 Support website. There you will find manuals, errata, schematics in pdf and orcad, gerbers, and layout info. You can also download software and information for booting over SPI (the board will also boot over SD card). An audio expansion board is listed, but only schematics and hardware information is provided at the time of writing. According to the press release from TI, the included code composer studio is a full-featured version normally priced at $495. I expect the software tools will be limited to this processor family, but that would still be a good value.